Alaskan halibut or Pacific halibut is the largest of all flatfish, they can grow up to 8 foot long and can be 4 foot across with a weight of over 600 pounds. Halibut of this size is a rarity, most will run from 10 to 200 pounds. Larger halibut that weigh over 100 pounds are often called "soakers" or "whales". Alaskan halibut that weigh less 20 pounds are called "chickens"
At birth, halibut will have an eye on each side of the head like most fish. But at about 6 months old one of the eyes will move to the other side. Making them resemble other flatfish in the family like flounder and sole. As you can see in the picture to the left one side of the halibut is dark while the other side is white. This helps protect the halibut from being preyed upon. The majority of halibut are caught with longlines in Alaska and British Columbia, but they can be found in waters along the Pacific coast from northern California to the Bering Sea. Don't mistake Alaskan halibut with California halibut. California halibut are usually between 4 and 12 pounds so these fish are commonly filleted, as they are not large enough to cut up in steaks. The flavor of California halibut will resemble summer flounder. Raw halibut is white and shiny, it should not be dull looking, yellow or have a dried look. The most common form of halibut you will find will be steaks, then fillets. 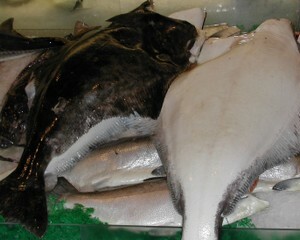 Some markets might have halibut cheeks too, which are considered a delicacy. Halibut is a very mild and sweet tasting fish with a dense but tender firm meat. But can dry out very quickly if overcooked. Cooked halibut will be a snow white meat that is flaky and tender, but yet firm. Halibut is another very versatile fish to cook with the dense meaty flesh holds up well to many different cooking methods. Including baking, broiling and grilling.